Sharp Actius RD3D with 3D toggle button. If using three-dimensional images enhances your work or play, there's now a notebook with 3D screen capability: the Sharp Actius RD3D. But it's big, bulky, and expensive. 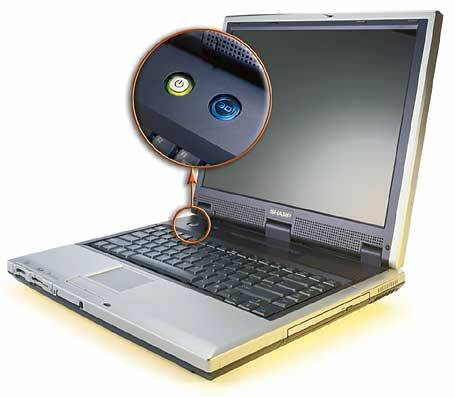 When the 3D function is on, light emitted by the laptop's LCD is divided by a "parallax barrier," causing slightly different images to reach each eye. When you sit centered in front of the notebook, your brain processes those varying images and gets tricked into perceiving depth, without special glasses. I found, however, that shifting position even slightly makes it impossible to see the 3D effect on an image. Fortunately, an easily accessible button that's situated above the keyboard turns the 3D feature on and off. But if 3D data visualization is useful to you, this notebook may be worth a try. Without 3D, the $2999 RD3D is a well-appointed, heavy (12 pounds), and expensive desktop replacement. Its 119 score in our PC WorldBench 4 test suite was slightly higher than those of other, similarly configured laptops; but our battery tests showed subpar results: 2 hours. Buy this notebook only if its 3D capability is useful to you.